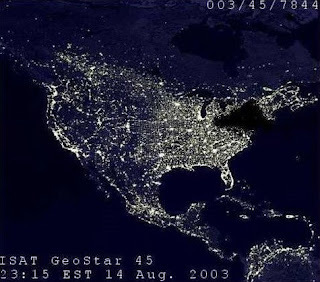 Every day approximately half a million Americans experience blackouts of two hours or more and power interruptions cost our nation’s economy more than $100 billion each year. Ever had the power go out—even for a few minutes—causing you to lose your work on a computer? Now multiply that times millions of people and billions of dollars in commercial and industrial operations. In a digital age, such micro-outages are even more costly than the infamous blackout of much of the Northeastern U.S. a few years ago. Small-scale outages caused an $80 billion hit to the U.S. economy in 2006 alone. We increasingly depend on the grid to provide not only electricity at the flip of a switch, but power that won’t fluctuate enough to crash or damage our many digital devices. The national averages for outage disruptions (SAIDI, SAIFI, and MAIFI) were estimated in a 2004 LBNL study at 106 minutes, 1.2 interruptions per year, and 4.3 minutes respectively. An IEEE 2005 benchmarking study analyzed data from 55 companies between 2000 and 2005. Results showed an eight percent increase in CAIDI, a 21% increase in SAIDI and a 13% increase in SAIFI. The relatively worsening trend in these indices suggests that a lack of investment in the delivery infrastructure is having an impact. The North American Electric Reliability Council’s 2007 Long Term Reliability Assessment (NERC 2007) predicts capacity margins declining in the coming years, suggesting that the reliability indices can be expected to continue to increase given current operating practices. While it is difficult to attribute the ability of smart grid implementation to slow any degradation or enhance the increase in reliability, smart grid related resources in terms of substation automation equipment, sensing and management should play a significant role. Power quality sensitive customers can be grouped into three areas. Generally, within these power quality sensitive markets, not the entire load at a facility is sensitive. Digital Economy – Firms with Mission Critical Computer Systems and Communications Facilities. Continuous Process Manufacturing – Manufacturing facilities that continuously feed raw materials, often at high temperatures, through an industrial process. Essential Services – This sector includes utilities and transportation facilities. Hospitals, nursing homes and other health care facilities need support for critical life support systems, medical equipment, and maintenance of critical HVAC environments. According to a study by the Electric Power Research Institute (EPRI Report 1004451, January 2003) the U.S. economy loses from $104-$164 billion annually to power outages. Today’s electricity system is 99.97 percent reliable. While on the surface that may sound excellent, it actually translates into an average of nine hours of disruptions each year for every consumer, distributed intermittently over periods lasting nanoseconds to hours. This standard still allows for power outages and interruptions that cost Americans at least $150 billion each year — about $500 for every man, woman and child. At present, the reliability of the U.S. grid is 5-10 times less than that of France or Japan. The average electricity consumer in the United States is likely to suffer nearly 30 times more service interruptions each year than his counterpart in Japan or Singapore. The electrical industry lacks visibility over its networks. In the event of a power cut, it is the customer who alerts the utility, which then sends out crews to track down the problem and fix it manually. Blackouts have far broader implications than simply waiting for the lights to come on. Effects of even a short regional blackout include plant production stoppage, perishable food spoilage, dark traffic lights dark, and inoperable credit card transactions. Blackstart Recovery – The process of restoring a power station to operation without relying on the external electric power transmission In the absence of grid power, a so-called black start needs to be performed to bootstrap the power grid into operation. The dynamic controller could also provide other ancillary services, such as aiding if programmed with that function. Generally blackstarts are made more difficult because of the large number of reactive loads attempting to draw power simultaneously at start up when voltages are low. This causes huge overloads that trip local breakers delaying full system recovery. The dynamic controller could have these loads "wait their turn", as it were until full power had been restored. Blackstart Capabilty – The ability of a generating unit to go from a shutdown condition to an operating condition without assistance from the bulk electric system. 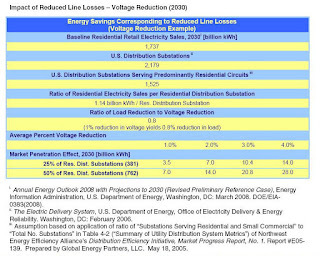 Brownout – When voltage is reduced intentionally in response to a shortage of electric supply. Out of service lines or transformers sometimes cause Undervoltage conditions usually lasting less than one or two days. Brownouts can cause overheating in constant speed motors due to the increase in current density as well as the problems with electronic equipment that occur with short-term voltage variations. Cascading – The uncontrolled successive loss of system elements triggered by an incident. Cascading results in widespread service interruption which cannot be restrained from sequentially spreading beyond an area predetermined by appropriate studies. CAIDI - Customer Average Interruption Duration Index - The average outage duration that any given customer would experience. CAIDI can also be viewed as the average restoration time. DVR - Dynamic Voltage Restorer - A means for a customer to ride through transients and momentary conditions. For voltage transients (dips, sags and swells) the DVR provides the required buffering to ride through such disturbances without noticeable effect on the production line. Connected in series between the grid and protected load, it compensates for transients caused by faults in the transmission or distribution system, thus a securing a safe power supply to the load. The DVR can be sized to virtually any voltage and load requirement but is best suited for medium voltage (MV) or high voltage (HV) applications. The DVR stabilizes the voltage directly at the facility level, which normally is MV in the distribution system. Energy storage for up to a 300 to 500 millisecond sag is provided by capacitor banks. EMI - Electromagnetic Interference - EMI consists of high frequency, low voltage signals coupled onto the power lines. Frequencies may vary from the kilohertz to the megahertz range, and magnitudes may be up to 10 or 20 volts. EMI can adversely affect telecommunications and other communications processes, hence the term, noise. Noise can come from a variety of natural and manmade sources. Natural sources include lightning, static electricity, and solar radiation. Manmade sources include power lines, automobile ignition, power electronics devices with high frequency switching, and fluorescent lights. Equipment Tolerances - Electronic equipment have steady state voltage tolerances of 90-110% of nominal voltage. Equipment can operate normally with an 80-110% voltage excursion of less than 10 seconds, 70-120% for less than half a second. Systems can operate normally with a complete loss of voltage lasting for only one or two cycles. Equipment can tolerate surges of 200% or more in voltage that last 1 millisecond or less, though such extremely short duration effects are not typical of power system disturbances. Flicker - A modulation of waveform voltage at frequencies of less than 25 Hz. This frequency modulation is detectable to the human eye as a variation in light output from standard bulbs – hence, the name. Voltage flicker is caused by arcing on the power system, such as from a welding machine or an electric arc furnace. Harmonics - Variations in the wave shape. Harmonic distortion implies that there are higher frequencies than just the 60 Hz frequency that defines the power flow. These higher frequencies can disrupt, degrade, and damage equipment. Some possible problems include overheating of distribution transformers, adverse effects on electronic equipment, and system resonance with power factor correction banks. Potential sources include computers, lighting ballasts, copiers, and variable frequency drives. Capacitor banks also can create resonant circuits which cause magnified voltages due to harmonic sources. Basically capacitor in combination with line and load inductance can create a tuned circuit for harmonic (multiples of 60Hz) circuits and thus magnify the voltage Electronic filters can remove harmonics. Electronic filters can remove harmonics. MAIFI - Momentary (Monetary)Average Interruption Frequency Index - This measure supports cost savings to customers associated with fewer disturbances and cost savings to utilities from longer equipment life due to less exposure to fault current. Electric power utilities may define momentary interruptions differently, with some considering a momentary interruption to be an outage of less than 1 minute in duration while others may consider a momentary interruption to be an outage of less than 5 minutes in duration. Recloser - Works as an automatic circuit breaker. Reclosers have the ability to distinguish between temporary and permanent faults by following curves set by the manufacturer. Once that fault is crossed a recloser will open and try to fix itself about three times so that manual labor isn’t needed. Hydraulic: Used in single-phase. At lower ratings, they use a spring to close; at larger ratings they use a coil. If there is a fault (short-circuit) in the electric line, such as a tree contacting an overhead line, a recloser or circuit breaker will open in an attempt to clear the fault. Customers located on the faulted feeder will experience one or more interruptions, depending on the type of fault and reclosing practices of the utility. For a temporary fault, one or two reclosings may be required before the fault is cleared and normal power is restored. Line reclosing occurs usually within one second; some utilities are experimenting with faster reclosing times – 0.3 to 0.5 seconds. For a permanent fault, the breaker locks out after a set number of reclosing attempts, resulting in a sustained outage on that line. Restoration – The process of returning generators and transmission system elements and restoring load following an outage on the electric system. TVS - Transient Voltage Suppressors - a general classification of an array of devices that are designed to react to sudden or momentary overvoltage conditions. UPS - Uninterruptible Power Supplies - Cost $200-500/kW - An electrical apparatus that provides emergency power to a load when the input power source, typically the utility mains, fails. A UPS differs from an auxiliary or emergency power system or standby generator in that it will provide instantaneous or near-instantaneous protection from input power interruptions by means of one or more attached batteries and associated electronic circuitry for low power users, and or by means of diesel generators and flywheels for high power users. The on-battery runtime of most uninterruptible power sources is relatively short—5–15 minutes being typical for smaller units—but sufficient to allow time to bring an auxiliary power source on line, or to properly shut down the protected equipment. Voltage Sags and Swells - Variations in the RMS (root mean squared) voltage from about one half cycle to several seconds. RMS rather than peak-to-peak is how the voltage is measured on an AC system. Sags refer to a reduction in the voltage, while swells deal with a voltage increase. Removing a large load or adding a large capacitor bank can also cause voltage swells, though typically of longer duration. Equipment used in modern industrial plants, such as process controllers, PLCs, adjustable speed drives, and robots are affected by sags and swells. Even for a few milliseconds may be long enough to corrupt data in microprocessor-based electronics and to cause malfunctions of digital equipment. Swells can damage device power supplies and/or cause resets to occur. Overvoltages and Undervoltages - When sags and swells last for longer than 2 minutes they are classified as over or under voltage conditions. Such long duration voltage variations are most often caused by unusual conditions on the power system. Most utility voltage regulation problems are the result of too much impedance in the power system to supply the load; customers at the end of feeders suffer the most from low voltage. Problems on the utility grid can cause higher than nominal voltages long enough to adversely affect facilities. This situation might happen because of problems with voltage regulation capacitors or transmission and distribution transformers. The utility does have overvoltage protection, but at times these devices do not respond fast enough to completely protect all equipment downstream. Voltage Notching - When silicon-controlled rectifiers (SCRs) are used in electrical controls, line voltage distortion in the form of “notches” occurs in the waveform. Line notches are an irregularity in the voltage waveform that appears as a notch. They are typically present in the waveform during SCR commutation or when a one-phase SCR is turned off and the next one is turned on. During this small amount of time, a short circuit exists between the two phases. This results in the current going high and the voltage going low. The types of equipment that frequently use SCR control schemes and thus experience notching include DC motor speed controls and induction heating equipment. VSMC - Voltage Stability Monitoring & Control - Software that uses a sensitivity-based successive linear programming method to reliably determine the optimal control solution. The Smart Grid and power system automation enables rapid diagnosis of and precise solutions to specific grid disruptions or outages. It can automate outage detection, restoration, and customer notification. With greater flexibility to locally target power quality resources, the ability to offer several pricing levels for varying grades of power can be considered. For those customers who are deemed power sensitive, the extra cost of premium power would be a worthwhile investment when compared with the lost revenue due to a loss of power. Intelligent head-end feeder reclosers and relays - Replacing electromechanical protection systems with microprocessor-based, intelligent relays and reclosers are an integral part of Smart Grid operation. Advantages include multiple functionality, including both instantaneous and time-overcurrent protection, greater sensitivity, better coordination with other devices, and the ability for self diagnosis. Approximately 70% of all feeders will include intelligent reclosers and relays by 2030, at an estimated unit cost of $50,000. Intelligent Reclosers - The use of intelligent switching and protection devices on feeders (referred to as “mid-point or tie-reclosers”) to allow isolation of segments of feeders to enhance reliability. Approximately 25% of all feeders will have intelligent reclosers and relays by 2030 at an estimated cost of $100,000 to $150,000. Remotely Controlled Switches - Remotely controlled switches contain distributed intelligence and use peer-to-peer communications to take actions without the need for central control intervention in order to isolate faults and restore power quickly in the event of an outage. As a result, distribution system operators will no longer be the only ones that can perform that function. It is estimated that 5% of all feeders will use one remotely controlled switch at a cost of $50,000 to $75,000 by 2030. Power Electronics - Including distribution short circuit current limiters. Advances in power electronics allow not only greater fault protection but flexible conversion between different frequencies, phasing, and voltages while still producing a proper ac voltage to the end user. Power electronics will be deployed on about 5% of 57,000 substations by 2030 at an average cost $80,000/package. Implement remotely monitored fault detectors so that outages can be detected before customers start calling in. Monitor distribution equipment so that alarms from unusual situations (e.g. overheating transformer, severe power quality fluctuations, swinging lines, etc.) are detected in real-time before an outage actually occurs. Monitor distribution equipment so that alarms from unusual situations (e.g. overheating transformer, severe power quality fluctuations, etc.) are detected in real-time before an outage actually occurs. Use the function “fault location, isolation, and service restoration” in combination with automated switching to detect and resolve many outages within the “permanent outage” timeframe. Automated switching to permit remote switching of feeder sections after an outage, thus possibly restoring customers before the loss of power is categorized as permanent. Set automated switching to occur before fuses blow, thus avoiding the travel time required to replace fuses. (There is a trade-off here of more customers potentially affected by the switching, versus the smaller number affected by the fuses. Power Quality - While the current system was designed to serve analog devices such as lights, motors and pumps, which work just fine despite varying electric loads, today’s personal computers and other smart digital devices with microprocessors inside are highly sensitive to even the slightest disruption in power as well as to variations in power quality due to voltage surges and sags and harmonic changes in the alternating electron flow. Power quality incidents in the past were often rather difficult to observe and diagnose due to their short interruption periods. The increase in power-sensitive and digital loads has forced us to more narrowly define PQ. For example, ten years ago a voltage sag might be classified as a drop by 40% or more for 60 cycles, but now it may be a drop by 15% for five cycles. Measurement Gaps - Power outages of less than five minutes are not even considered a reliability issue by many state regulatory authorities. Spending for Backup Power - The U.S. telecommunications industry alone spends over $2 billion each year for backup power to compensate for grid deficiencies and to avoid essential service outages. Lost Production Line Run - Sun Microsystems estimates that a blackout costs the company $1 million every minute. Lost Sales - In 2000, the one-hour outage that hit the Chicago Board of Trade resulted in $20 trillion in trades delayed. Reduced Productivity - A rolling blackout across Silicon Valley totaled $75 million in losses. Avista Utilities (NYSE: AVA) Spokane, WA, operates primarily in Washington, Oregon and Idaho. The utility focused on distribution reliability and efficiencies in 2006 and won three federal stimulus grants in 2009, of which the Spokane "Smart Circuit" project is one. That $42 million project involves 59 circuits, 14 substations and 110,000 customers. Isolating faults and rerouting service will shorten outage restoration time, for example, Cummins said. Larger conductors, dynamic voltage regulation and dynamic reactive power compensation all will increase the energy efficiency of the system—to the tune of 42,000 megawatts annually. Avista also is involved in a $178 million, 11-utility, five-state "Pacific Northwest Demonstration Project" involving 60,000 metered customers in cost/benefit analysis involving demand response, energy storage, renewables integration, distributed generation and smart appliances. Avista's piece is its Pullman, WA, distribution automation efforts ($38 million) that include home energy management technologies. BPL Global, Pittsburgh PA - Provides software solutions and services to electric utilities enabling an intelligent grid to more efficiently manage demand, integrate distributed energy resources, improve service reliability, and optimize cost and capital productivity. Partners with local utilities, internet service providers, equipment suppliers and financiers to create end-to-end solutions integrating software, communications, hardware and managed services. BPLG's Rapid Fault Locator solution detects and reports line faults on distribution feeders, and provides continuous monitoring of the line conditions avoiding faults and reducing the duration of outages. An intelligent grid depends on a secure and robust communications platform to manage the significant increase in data capacity required to support two-way communications between a centralized software platform for monitoring and control and any smart devices distributed throughout the electrical network. BPLG offers communications solutions from basic network monitoring, to robust smart grid communications, to last-mile broadband services to consumers and businesses. The Interruption Cost Estimate (ICE) Calculator is a tool designed for electric reliability planners at utilities, government organizations or other entities that are interested in estimating interruption costs and/or the benefits associated with reliability improvements. This tool was funded by the Lawrence Berkeley National Laboratory and Department of Energy and developed by Freeman, Sullivan & Co.
Black-outs cost America an estimated $80 billion a year, according to a study by the Lawrence Berkeley National Laboratory.